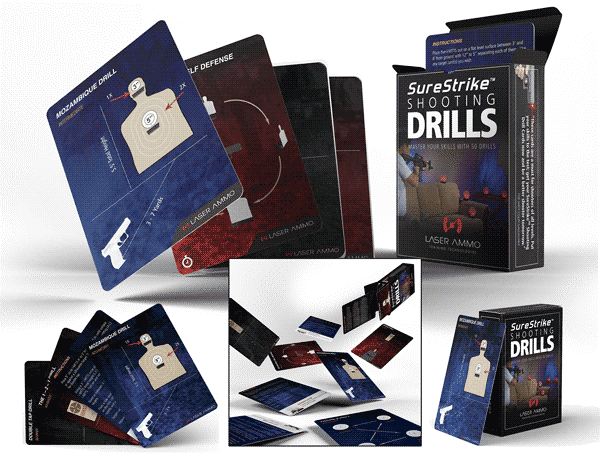 SureStrike™ Shooting Drill Cards are designed to enhance your shooting skills and take you to the next level regardless of your experience or training. Finding quality, safe, challenging and inexpensive firearms training is always a challenge for people of all levels. Now you can have the best dry fire training on the market! 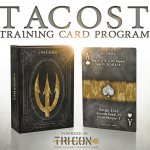 This deck of 50 shooting drill cards, was carefully picked by History Channel’s Top Shot, Colin Gallagher, and approved by NRA trainers and professional shooters. SureStrike™ Shooting Drill Cards will individually address your skillset and train you to master sight alignment, sight picture, breathing and trigger control with all your firearms. For those not able to make it to the range as often as they like can still practice the fundamentals of shooting through dry-firing in the convenience of your home or office. Dry-fire training is the single most efficient and safest way to increase your skills regardless of your experience level. It allows you to increase proficiency with your draw, speed, sight acquisition, trigger control, and accuracy of your reloads. It also smooths and speeds up your transitions, assists in controlling breathing and heart rate, and allows you to incorporate basic movements. Starting out slow ensures that your fundamentals are flawless through repetition, before increasing speed or distance to your targets. By continuously repeating these drills without errors, you will build “muscle memory” and will allow the techniques to ingrain into your subconscious. This will allow for your actions to be duplicated automatically when you return to the range -or if you are ever thrust into a shooting incident. Be the first to review “SURESTRIKE™ SHOOTING DRILL CARDS” Click here to cancel reply.